With the amount of data being created electronically today, accounting records, customer information, business contacts, emails, patient data and others, it has become increasingly important for all organizations, large or small to back up their data. In the event of hardware failure, disasters, or theft, you can be left without your data, critical to the operation of your business. Conventional backup approaches are not good enough nowadays with the exponential rate at which data grows. Poor “unstructured” backup methods such as tape, CD/DVD, and removable/external drives fall short in providing a reliable solution due to the high costs involved in maintaining the different mediums, their fixed capacities, and unreliable offsite storage procedures. We can help put your mind at ease with our proven solution. We can prevent the loss of your business’s crucial data, caused by any disastrous event that may occur. 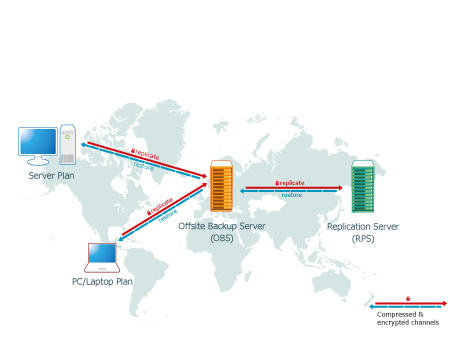 Get your critical business data protected by CR Servers NOW! © Copyright 2016 CR Servers - Sistemas Edenia Internacional S.A.